Gionee company was launched his latest smartphone with the name of Gionee M7 Power in the Chinese market in September 2017. Now this smartphone ready to rolled out Globally. This smartphone comes with 6.00-inch touchscreen display with 2.5 curved glass with 1440×720 pixels resolution with 18:9 aspect ratio. The Gionee M7 Power dual SIM smartphone is by 1.4GHz octa-core Qualcomm Snapdragon 435 MSM8940 processor with 4G VoLTE support. The Gionee M7 Power smartphone is globally launched and this handset comes with 5000 mAh battery. This smartphone priced at USD 299 that comes approx Rs. 19000 in the Indian market. Gionee M7 Power a mid range dual SIM smartphone which is globally launched. This smartphone is powered by 1.4GHz octa-core Qualcomm Snapdragon 435 MSM8940 processor. This smartphone is running Amigo 5.0 which is based on Android Nougat 7.1.1. This hybrid dual Micro-SIM (GSM+GSM) smartphone comes with 4GB of RAM and 64GB internal storage capacity. You can easily extend storage capacity up to 256GB with the help of microSD card. The dimension of this smartphone is 156.3×75.6×8.6 mm and weight is 187 grams. As far as the cameras are concerned, the Gionee M7 Power smartphone comes with 13MP rear camera. This smartphone comes with 4208×3120 pixels resolution with LED flash and f/2.0 aperture and 8MP front shooter for taking selfies. The Gionee M7 Power dual SIM (GSM+GSM) smartphone has two Micro SIM slots. As per connectivity concern, it include Wi-Fi, GPS, Bluetooth, USB OTG, FM, 3G and 4G VoLTE support. This smartphone also comes with Compass Magnetometer, Proximity, Accelerometer, Ambient light and Gyroscope sensors. This smartphone priced at USD 299 and comes approx Rs. 19000 in the Indian market. 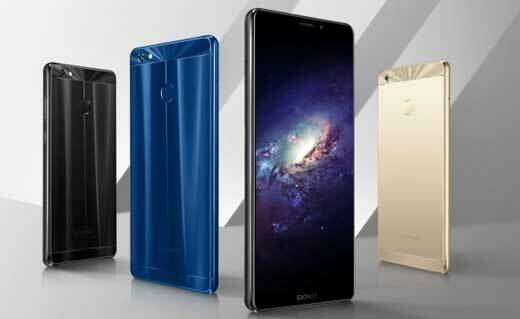 This smartphone available in Blue, Black and Gold colors. The Gionee M7 Power smartphone powered by 5000mAh non removable battery. Gionee is very popular Chinese smartphone making company which was established in 2002. Now Gionee is a brand which show his present in India, Vietnam, Taiwan, Myanmar, Thailand and the Middle East countries. Gionee company has launched different low and mid range smartphone in different countries.